MotoOnline.com.au tests the 2018 KTM 500 EXC-F.
For 2018 much of the noise from KTM has been around the Austrian brand’s groundbreaking TPI two-stroke models, which is fine, because in 2017 KTM made a fair impact with its entire four-stroke range that made a lasting impression. As the KTM 500 EXC-F had been completely redesigned from the ground up last year, with the mantra behind the new design being ‘lighter, faster, stronger’, it is safe to say that KTM knocked it out of the park at five kilograms lighter, with 63hp and boasting significant race results around the world. This time around, KTM didn’t need to reinvent the wheel, so it was all about refining the 500 EXC-F. What you’ll find here are subtle tweaks that make the 2018 KTM 500 EXC-F that much better. 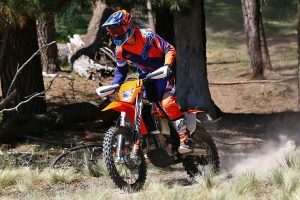 We loaded up and headed to a private farm on the door step of Belanglo State Forest to meet up with KTM Australia representatives, getting a feel for the 2018 KTM 500 EXC-F and the updates from the 2017 models. An epic grass track with plenty of twists and turns, along with fast, open corners was really fun on the 500, but the tighter corners sure came up quick. With the farm situated almost within the forest, it was only a quick ride to some pretty cool, loamy single-trail within the pines. 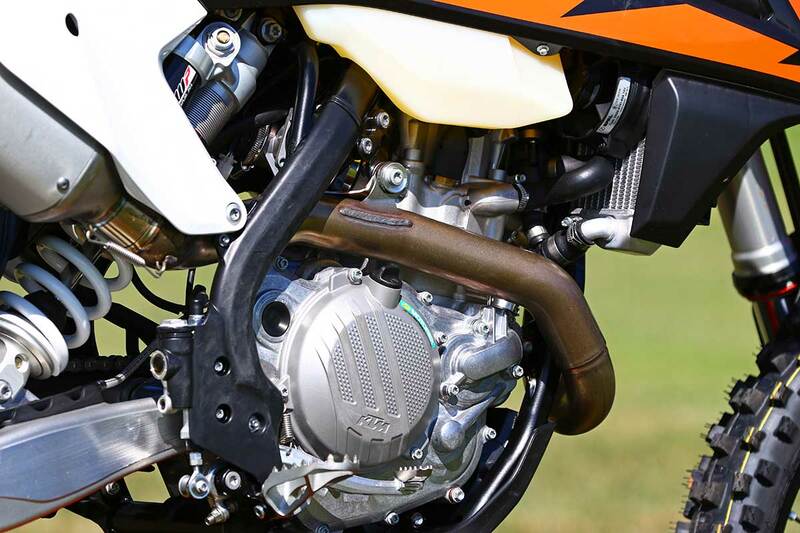 KTM has improved its cooling system, which routes the coolant from the cyclinder-head through the frame triangle directly to the radiators, also featuring new radiator protectors. The radiator protectors help improve heat dissipation, as well as add protection in the event of a crash. WP has revised the internals of the WP XPlor 48 forks and PDS shock absorber, while the forks also received new outer fork tubes that were carried over from the SX-F models. Combined with the updated factory settings that provide improved sensitivity and damping, a sealed hydro-stop guarantees excellent resistance to pushing through the entire 300mm of travel and bottoming out. A few things that we really appreciate that carry over from the 2017 model are the Brembo brakes and hydraulic clutch. On top of that, the air-box design is user-friendly and it’s easier to access with a multi-directional filter cage that gives a better seal than past variants. The opaque 8.5-litre fuel tank with its integrated fuel pump not only looks trick, but is functional as well. No dirt foot-pegs and gear-shifters are a great touch – a design to prevent problems out on the trail, which is going to benefit your riding experience at some point down the track. The ODI Lock-on grips make things a little easier when replacing and overall they’re just a good finishing touch. One aspect that still looks a little odd to me is the lack of a kick-starter, however with the improvement of technology, they are going to be a thing of the past very soon – it certainly is on the 500 EXC-F. 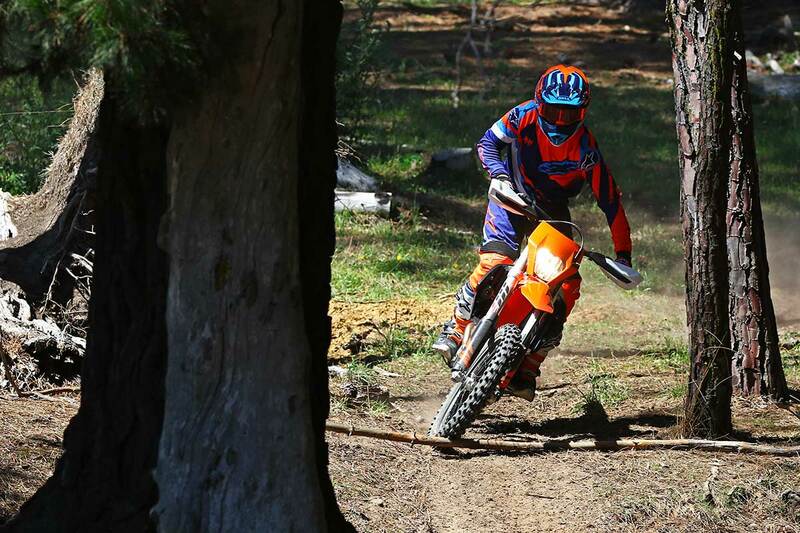 There is something enjoyable about scaring yourself enough, but while still being able to enjoy it, and the KTM 500 EXC-F does that for sure. With 63hp, it doesn’t take much to twist the throttle a little more than your talent can accommodate and you will most definitely understand what you’re working with, but that is the fun bit, right? With so much power for open trails, the corners come up plenty quick, although it is relatively smooth on throttle application so it’s manageable in building up to speed. 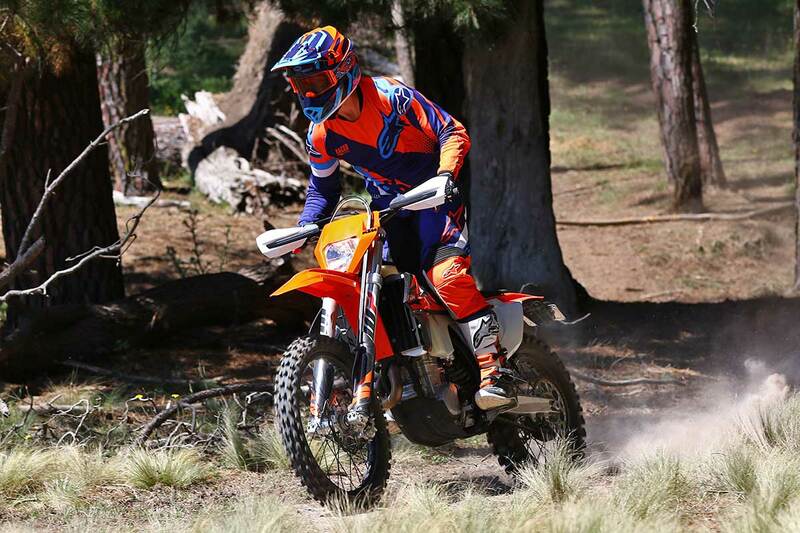 The 500 EXC-F sports a six-speed transmission with tailor-made ratios, while a clever gear-sensor adjusts the engine’s power curve to the selected gear, as well as the trail surface. 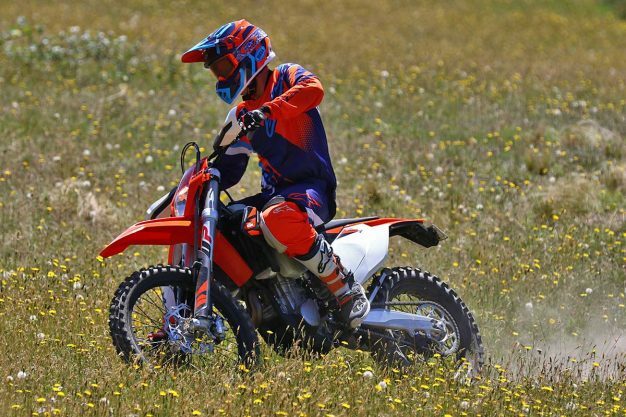 KTM has developed a traction control and a mapping switch for the entire off-road range, which can be purchased separately and fitted very easily through the PowerParts catalogue. 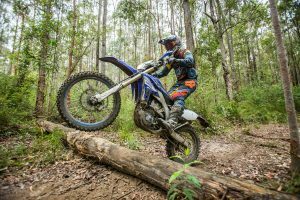 The 500 EXC-F makes the most out of this function, making the bike more rider-friendly in either tougher and tight or wet and muddy conditions. As mentioned, KTM started from the ground up with a complete redesign in 2017. With that, engineers were able to make the engine more compact, which allowed the Austrians to make the frame and chassis smaller as well, centralising its overall mass. Bringing everything closer to the centre of the bike has improved handling, which really seems to be the trend with all manufacturers at the moment. 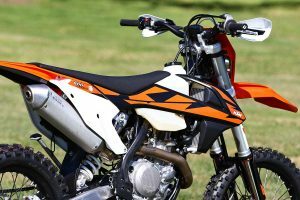 The improvement on the EXC-F chassis is probably highlighted most of all on the 500, as it is a slightly heavier bike than its siblings at 106.5kg with the larger engine capacity. The Chrome-molybdenum steel central-tube frame itself has been improved for better rider feedback and to help limit fatigue as much as possible by changing the rigidity of the frame, both side-to-side and front-to-back, which provides better absorption and flex. 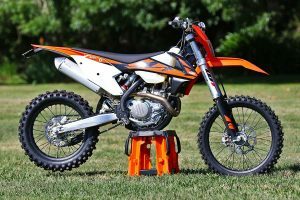 In terms of the suspension, WP has hit the nail somewhat close to the head, because the package works great and with a few minor changes from last year’s model, the 2018 is even better. Improvements made have had a direct impact on the performance and handling of the bike in a positive way, although more seat time would always be a benefit in these instances. 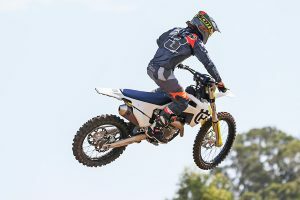 Overall the 2018 KTM 500 EXC-F is exceptional and there isn’t really anything that comes close in class aside from the similar-make Husqvarna. The finish of the bike itself, its weight, huge power and precise handling are all what you come to expect from the Austrian manufacturer. A bash-plate would probably be one of the first things to add on, plus we didn’t get to ride the 2018 with a traction control switch, however we did on the 2017 model. That was one thing that really made a big difference on the big-bore four-stroke, as the ability to change the characteristics of the motor on the fly was really noticeable and helped tame the power through the tighter trails. Indirectly, it made muscling the bike around that little bit easier, which helped with fatigue and we could hold onto it longer. Suspension-wise, a preload adjuster can also be fitted to allow for simple spring pre-load adjustment without the use of tools. All in all the 2018 KTM 500 EXC-F is an amazing bike, with more power than you know what to do with. 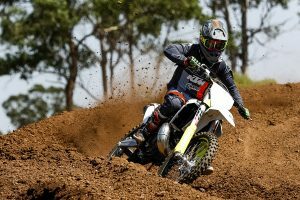 It handles brilliantly at only 106.5kgs (plus fuel), the WP XPlor 48 fork paired with the rear shock works a treat, its overall bodywork, finish and feel of the bike is first-class. It comes in at a recommended retail price of $14,695 plus on-roads – $200 more than last year – and is now available at dealerships across the country.